Spider Veins and Varicose Veins – What’s the difference? First let’s talk about varicose veins. These are swollen, large and raised blood vessels, which usually develop in the legs. Varicose veins twist and turn, and are visible through the skin. 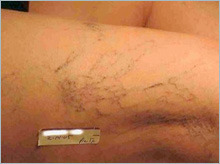 Spider veins are smaller than varicose veins. They are typically red, purple and blue in appearance. Spider veins are often found on the legs and the face; they also twist and turn and are visible through the skin. Externally worn garments such as girdles. Women develop varicose veins and spider veins develop more often than men. The appearance of these veins increases with age. Approximately 30% to 60% of adults are estimated to have varicose veins or spider veins. People who have varicose veins often complain of pain, described as an aching or cramping in the legs. Other symptoms can include tiredness, restlessness, burning, throbbing, tingling, or heaviness in the legs. This pain may be relieved by elevating the legs or by wearing support hose. Symptoms may worsen during certain parts of the menstrual cycle or during pregnancy. Swelling, ulcers and a darkening of the skin, especially in the ankle region may occur. Occasionally, a condition called thrombophlebitis may occur, where a painful blood clot forms with inflammation of the vein. Time and gravity are the big enemies in the battle against loose skin. As we age, even though we may be in excellent physical condition, skin loses elasticity, collagen weakens and pockets of fat develop. Wrinkles and fine lines begin to appear and if we have a genetic predisposition to cellulite, unfortunately, it shows up as well. Venus Legacy provides a non-surgical, non-invasive treatment with superior results and no downtime. Plus it’s pain-free. A revolutionary treatment, Venus Legacy uses Radio Frequency, Magnetic Pulse Therapy and VariPulseTM technology, to treat all of the skin conditions we just mentioned. This varies from patient to patient, and will need to be discussed prior to treatment to determine the right package for you. The answer is yes. This type of therapy has been used for many years and is proven to be a safe and effective technology. You will need to review your medical history and discuss your treatment goals with your treatment provider to determine if this is the right procedure for you. There is no downtime with Venus Legacy. Treatments take less than 30 minutes per treatment area, and you can have a procedure done on your lunch break and return to work immediately afterwards.